Hover your mouse (Mahjong Garden): As shown in the picture below, navigate to the site's Mahjong Garden game and STOP. Now start my Jongy and hover your mouse on your Score at the bottom left of your game, exactly as the pink arrow down there is showing. The auto should recognize it, beep at you, snap your mouse away and start playing your game. No Hints Refresher (Mahjong Garden): This option is strictly for challenges that don't allow the use of hints, such as "Win a game using 3 hints or less". For every other Mahjong Garden quest (ranking up and all other badges), which is 99% of the time, you need to keep this option off/disabled because it's obviously not needed and will just be slowing you down. But if you do need to use it that other very rare 1% of the time, the auto will simply refresh your browser at the very end of each game with usually only two tiles left. This magically "erases" all of those Show All fwack sessions (considered hints) and then Jongy quickly finishes off the level as hint free. Depending on the remaining final tiles, it may need another refresh sometimes (but very rarely more than two). When using this option, you need to remember two things to avoid refresh issues. Do not choose your own room. Simply click that yellow Start Game button instead (at the top of Mahjong Garden's main home page). And stay out of the game site's pop-up window mode. Click My Account at the top of their page, enter your password, choose the Security tab on the left panel, scroll way down to the bottom, uncheck that Open games in a pop-up window setting and save your changes. Embedded games should really stay that way, rather than opening them in yet another browser window, which is actually a fake pop-up with the same exact original page content. A second, unnecessary window. Still have old graphics? For some reason, in Mahjong Garden, maybe 5% of you are still loading the old smudgy graphics. Take a look at the picture below (and click it for a much larger version). See the crisper 3-d new stuff on the left? And the older grainy stuff on the right? All of those rocks at the top are much more defined with better shadowing and color. 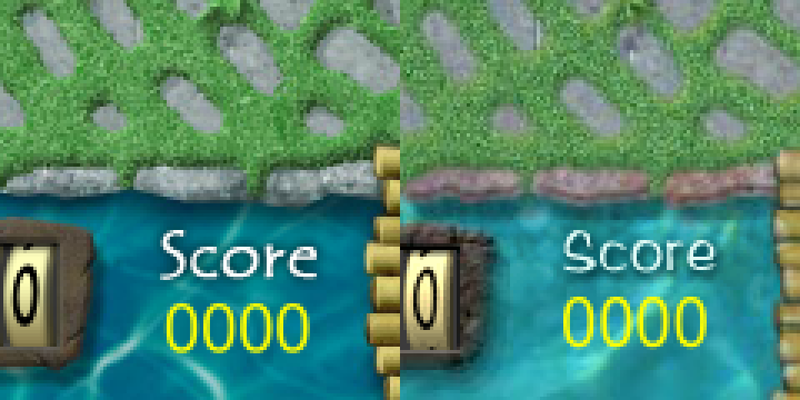 Look at the huge difference of the fonts in the white word Score and the yellow numbers 0000 below it. The entire timer area on the left side is completely changed, as well as the lighting ripple effect in the water and super crispy bamboo now. So as you can guess, all of your tiles are also gross and ancient still. If you have the older graphics on the right, the game site has not upgraded your game quite yet... and nobody knows why. I was able to pump out a side version for you guys (Jongy29a). There have been quite a few people that reported one of the other browsers loaded the new graphics (Chrome, Firefox, Internet Explorer, especially Opera or Torch). It has been narrowed down to be machine-specific. Not country regional, not internet-ip address, not even account related. There are people that can load the game with Chrome and have old graphics, then open Opera and have the new stuff using the same computer and account. Others can waltz ten steps across the room to use a laptop over there and have the new graphics. The game site has been made aware and either do not reply or give cheap excuses, such as blaming Chrome for not updating themselves... completely unwilling to take responsibility. Yeah, I guess Microsoft and Mozilla need to "update themselves" as well, because these same people are loading the old graphics on those browsers too. A third complaint was a phone callback (in which she got absolutely nowhere), with children laughing/playing in the background, pots and pans clanging. She thought she was about to hear "Honey... supper's ready in five!" 29/29a (12.30.2017) Actually, the best solution here is just to go back to clicking New Game when their ShowAll button breaks. Problem seems to be solved. 28/28a (8.8.2017) Mahjong Garden is not properly registering the ShowAll button for some of you. The tiles on your board are not turning grey like they should, so the auto was assuming there was nothing up there to do (and clicking New Game). This version is the best solution I can offer for your broken/lagged game. 27/27a (6.8.2016) A few had yet another moved game summary Play Again button in Mahjong Garden. 26/26a (5.6.2016) Some of you had a moved game summary Play Again button in Mahjong Garden. This version should cover both. 25/25a (12.11.2015) Mahjong Garden's new moody winter background (with the trees) has brighter colors on those 12 stepping stones, confusing the auto sometimes with a Which zodiac? stall. Thanks for letting me know in time before Wednesday's challenge, Mary. 24/24a (9.2.2015) The 16th birthday background change in Mahjong Garden caused a repeating stall on the Dragon level (or the Ram for people with old graphics). Thanks for letting me know, Carolyn. 23/23a (6.15.2015) Lots of changes in Jongy concerning Mahjong Garden. For starters, every option inside the auto was completely ripped out and hit the trash can: Match Seasons, Match Flowers, Show All, Next Tile Set, Puzzle Type and Undo Last. It's almost 10 years old at this point and times have changed. For example, Jongy prioritizes the matching of seasons/flowers. Just about every single game has that little 4 Seasons Bonus! plaque sliding down from the top of the screen and those constant colorful (purple, aqua, yellow, red) flower match explosions proving my point. Further, the auto now covers all 8 different Tile Sets again, as well as both Puzzle Set layouts (Animals and Temples). It's very possible that the Temples may be your better choice for quicker zodiac completions. And obviously, the Easy difficulty is always your best bet, unless a challenge requires otherwise. Now go read the No Hints Refresher tip at the top of this page. You want to keep this new option disabled at all times... unless you are working on a "Win a game using 3 hints or less" badge or similar. Got it? I have a feeling I will be sending a whole lotta people here that didn't take the time to help themselves by reading. 22a (1.24.2015) That side file for you rare old graphics people is now available in the above Still have old graphics? tip. Note that your old version of the game is moody/quirky with some errors, unlike 95% of us with the new graphics. Not my fault... make a complaint. 22 (1.20.2015) Broken yet again. This version should have Mahjong Garden working for just about everyone, not including the rare 5% of you with old graphics still. I am headed that way next, to attempt a side file for you poor guys, as I have done for a good half dozen other games/autos. Can't promise anything quite yet, but I am sure gonna give it a shot. 21 (12.6.2014) Well, they broke it in June, July, late August. I updated them. They broke it in September. Fixed it. And they broke it again. This time with severe tile shading and weird behavior. 95% of the tiles were pushed south one pixel. Depending on how high the stack, the lighter-brighter the tiles. All tiles from all tilesets are completely different, and that's a lot. Therefore, at this time, I have temporarily disabled all of Mahjong Garden options (except Speed). The auto will force you to play the Animal layout and Nature tileset. This means it will be a (very fast) ShowAll fwack, ShowAll fwack fest. I think this may be the fastest Jongy ever. I recommend Easy difficulty, of course. Unfortunately, if you have a challenge that doesn't allow "Hints", this version is not gonna help. You are just gonna have to wait for the next update... which is on my immediate to-do list once I am fully ketchup'd. 20 (9.12.2014) Added the other seven Mahjong Garden tile sets and re-enabled that Next Tile Set option. 19 (9.7.2014) Once again, Mahjong Garden got yet another makeover. The tiles, popup windows, everything. 18 (8.29.2014) Mahjong Garden is now officially converted to Flash for everyone. This brought huge graphic changes to the entire game and is still a work in progress. At this time, the auto only plays the default tile set until I get a chance to re-harvest the other seven, therefore the Next Tile Set option has been temporarily disabled. The Flash is very laggy, so I recommend jacking the Show All option all the way to 100 (if possible), unless you have a challenge not allowing hints. Top 100 speed is not recommended... you can accomplish much more and reduce the wear and tear on the game going slower. Even 90 or 75 speed can make a big difference. We now need to hover the mouse on our Score to get started properly, so be sure to read the above tip. The Opera web browser isn't too shabby on this one, btw. 17 (7.1.2013) The new better animals in Mahjong Garden caused a stall once you beat the Dragon and reached the Snake. There was a similar color from the old beaten Dragon that made the auto think you were always in the Dragon's layout, hence never finding any tiles. Thanks for letting me know, everyone. Was a tough thing to find but easy to fix, with Jongy kicking in immediately after. 16 (6.24.2013) Mahjong Garden's Play Again game summary screen was moved, so the auto was showing Blocked, at least in Firefox. Stuck a nice band-aid to fix that. They need to fire that happy Mr.ILikeToMoveTheGameAllOfTheTime guy. But thanks for letting me know, Deb. 15 (12.14.2012) Mahjong Garden's Show All was rather moody after the Win8 update. Should be good to go now, so make sure you crank that bad boy up to 100 for super-fast rank progress. 14 (11.30.2012) Both were updated for Windows 8 compatibility. 13 (9.7.2012) Mahjong Garden was Not found in Internet Explorer. 12 (7.27.2012) Mahjong Garden is now embedded into the browser with a new game summary Play Again button. 11 (4.24.2012) WordJong™ was not working on the UK side. 10 (4.11.2012) WordJong™ is now embedded into the browser. 9 (11.10.2010) Mahjong Garden was acting a little strange for a few of you today. Hopefully this update takes care of that. 8 (10.19.2010) They changed both window sizes this morning. Easy fix. Thanks for letting me know, John and Donna. 7 (9.8.2007) No changes made. There was a false virus reported by Avast. The fake infection magically vanished after I re-created this identical updated .exe version. I apologize for their annoyance. Also, I don't think that the requested "Win Percent" option is quite necessary yet, but I am considering it. Isn't it just easier to play with the given options, which fluctuate between an acceptable range of wins and losses? For example, changing from Easy to Medium, or Medium to Hard difficulty will definitely change your winning percentage. Sliding the "Puzzle Type" option to 50% will flip between animals and temples every other loss or so, which definitely will win more or less games randomly. Even the "Undo Last" option will increase wins slightly when enabled. Checkmark either or both "Match" options at the top to help lower your wins, since you are making it more difficult for the auto. These are my thoughts, let me know if I am wrong. I put these options in, and sometimes you just have to fiddle with some things properly to get what you are after. 5 (3.20.2007) This version will play the updated Mahjong Garden game's new tile sets and Temple layouts. Press the Ctrl key on your keyboard to pause. Beginning each new puzzle you will notice the screen “Select a Tile Set/Select a Puzzle Set”. Jongy is not changing anything if you have the Next Tile Set and Puzzle Type options turned off (zero), but rather just checking to see which sets you are using real quick. Match Flowers option added in anticipation of future badge challenges. It will match all flower tiles. Show All is a very handy option to increase your timer by having Jongy click it to add a 20 second time penalty to your clock. Your game timer will look more realistic when taking advantage of this super option! Next Tile Set option will rotate through the different tile sets. After each win or loss, you can set this option to switch at whatever interval you desire. Another added option in anticipation of future badge challenges. Puzzle Type option will allow alternating between Animal and Temple tiles. If a certain board (zodiac animal) is struggling, this option will help by changing the type of puzzle at interval you set. This option will also help in possible future badge challenges. Recommendation: opt for temple tiles only and turn this option off for probable fastest rank advancement. Rank advancement is based on finishing each zodiac animal (your dragon ages 4% each time an animal is completed no matter which difficulty setting you choose) playing on easy may be best as it gives more holding areas at the bottom for tiles. Medium and hard difficulty settings are much easier with temple tiles. Undo Last option. With this option checked (highly recommended) Jongy will only use the "Undo Last" button at the end of the round in order to quickly go through all remaining tiles for possible matches before hitting new game. Testing has proven this often saves you from game losses, especially on medium difficulty. 4 (6.1.2006) Fixed the "Match seasons" option. Sorry about that. 3 (5.31.2006) Looks like my entire registered Jongy family just got a free bonus, so I guess you earned it just by making the smarter BadgeWinners choice. It's another 2 in 1 auto, currently my 7th release capable of playing more than just one online game. Beware when using the "Match season" option (for Mahjong Gardens), as the increased difficulty could make it struggle from time to time. Many of you requested this option to help get the premium badge and since the older version needed the latest shell anyways, it all seemed to piece together. As for the WordJong™ inclusion, it has 3 options available to help slower operating systems. This auto contains the game's actual 50,000+ word library, so you will be impressed with the amount of 7-letter words it produces. Crank it up to the hardest difficulty, since it also goes after the green bonus tiles by choice. Very crisp and smooth clicking action in this one and double browses as well. Doubly provides you with the ability to cover two accounts by mixing and matching either of these two online games at once. But in any case, remember to slide the Speed option down if either of the Jongs are not performing as they are expected. 2 (11.26.2005) I added two things only, leaving everything else exactly the way it was. First, it should minimize any winning popup windows (badges, congrats) that may have stopped the auto. And #2, I added a speed option so people can slow it down to their liking. Do note that some of those boards are still easier than others, so you may want to play with it a bit. I do not recommend using the fastest (100) setting, as it will probably not read the board perfectly. If you like it fast, I felt comfortable in the low 90s and would suggest using Sun for smoothness. If Jongy seems to have lost some intelligence in this release, all you have to do is slow it down! 1 (10.31.2005) This one plays best on Easy, decent on Medium and can still hang on Hard difficulty. Take advantage of this fact by keeping your win-loss percent where you need it. Use the SHIFT key on your keyboard to pause this auto. It can struggle once in a while, but randomizes the next search to eventually guarantee a victory. Copyright © 2005-2017 BadgeWinners. Trademarks belong to their respective owners. All rights reserved.